Schools will see a one-off surge of children starting first grade this year thanks to a spike in births in 2012. In the Year of the Black Dragon, which was thought to be auspicious for marriage and childbirth, some 484,550 babies were born, the most in six years. Some 12,953 children in Gangwon Province are expected to start elementary school this year, compared to 12,392 last year. 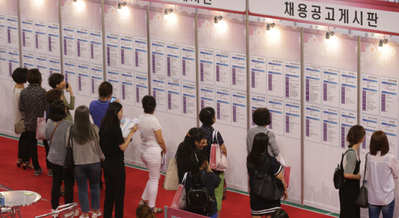 The southern port city of Busan, which has one of the country's lowest birthrates, expects 29,041 new first graders, up 2,606 students from last year. And Ulsan, another port city in the southeast, expects 68,294, up 1,146. Children and mothers visit an elementary school in Sejong City in this file photo from Dec. 28, 2018. Children born in 2007, the last Year of the Golden Pig, start sixth grade this year. That year childbirth rose 10 percent from the previous year to 496,822. This Year of the Golden Pig is also expected to raise the birthrate slightly since it is thought to augur wealth.